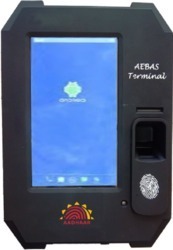 Pioneers in the industry, we offer aadhaar enabled attendance system and aadhar enabled biometric device from India. MANTRA MFSTAB is suitable for both basic to moderately complex time and attendance requirements. The 7"Touch screen offers a wide range of possibilities, starting from the classical Time recording App to a complexFactory Data Collection App or a high-security solution with ccess queries supported by a comparison of liveimages with stored images or audio-visual communication to a Service Command Centre, e.g. for Datacentres. Everything is possible. MANTRA MFSTAB Terminal is all-in-one, affordable, WiFi enabled terminal. It can be used for various applicationssuch as Time Attendance, Access Control, Workflow Management, Canteen Management, VisitorManagement, Worker Management etc. This innovative Biometric clock will ramatically improve your abilityto monitor your workforce movements during their working patterns and with features that gives you bettertime and management reporting.MANTRA MFSTAB is suitable for both basic to moderately complex time and attendance requirements. 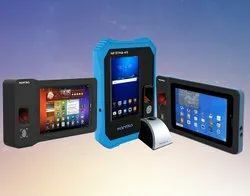 The 7"Touch screen offers a wide range of possibilities, starting from the classical Time recording App to a complexFactory Data Collection App or a high-security solution with ccess queries supported by a comparison of liveimages with stored images or audio-visual communication to a Service Command Centre, e.g. for Datacentres. Everything is possible.